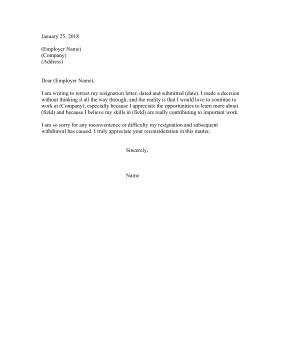 This brief retraction letter petitions an employer to allow the employee to stay in their position and withdraw their resignation from consideration. I am writing to retract my resignation letter, dated and submitted (date). I made a decision without thinking it all the way through, and the reality is that I would love to continue to work at (Company), especially because I appreciate the opportunities to learn more about (field) and because I believe my skills in (field) are really contributing to important work. I am so sorry for any inconvenience or difficulty my resignation and subsequent withdrawal has caused. I truly appreciate your reconsideration in this matter.